Congratulations to everyone who is currently completing my Sugar Free September 2017 challenge. This is the biggest and best mega-giveaway I have ever run. There are 25 prizes up for grabs. Affiliate disclosure – Some of these may be affiliate links which helps fund the website to continue, develop and improve. Any commissions earned will help my website to remain free forever. Please consider purchasing through my website to help cover the costs of running Sugar Free September. Thank you for your support. Scroll below to grab some insane discounts that are available to EVERYONE. If you can’t wait until the prizes have been drawn, and want to get started straight away, simply click on any of the pictures to buy your own copy, or why not buy a copy for a friend who helped support you through Sugar Free September 2017 to say thank-you. 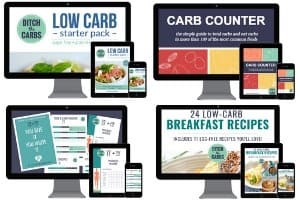 5 copies of my Low Carb Starter Pack – the complete beginners guide. It’s an absolute beginners guide to living sugar free, gluten free, grain free and low carb. It explains why sugar is so harmful and why wheat and grains don’t belong in a healthy diet. You’ll learn what is a healthy fat and why you should be eating more. To order your own copies, click here. 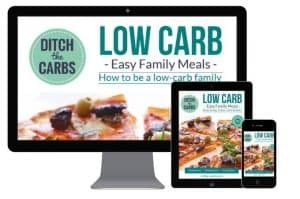 5 copies of my Low Carb Family Meals – how to be a low carb family. Do you want your family to eat healthier? To cut back on sugars and processed food? Do you want your children to stop the soda and junk food? Would you love your family to start eating healthy, unprocessed, low carb meals but simply don’t know how to start? This book will teach you everything you need to know to become a low carb family. There is a 5 point action plan to help you remove processed food and junk from your daily diet. You’ll learn how to make easy family meals, even healthy fast-food. 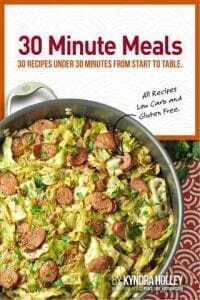 5 copies of 30 Minute Meals eBook – kindly donated by Kyndra Holley, of Peace, Love and Low Carb. Her eBook cookbook contains 30 recipes which can be made in 30 minutes from start to table. Now who doesn’t want that to make your life easier? Each amazing recipe is sugar free, grain free and simply stunning. Eating low carb and keto doesn’t need to be difficult, nor does it need to be time consuming. Kyndra is all about to release her new printed books, take look. Craveable Keto (your low-carb roadmap), and Keto Happy Hour, for al the cocktail lovers out here who want to stay on track. 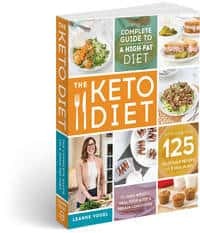 The Keto Diet is the practical guide to eating fat and ending food obsession to reveal vibrant health, jacked-up energy, and effortless weight loss. It provides you with all the facts, and you get to choose how to develop a ketogenic diet that works for you and your individual needs. Take a look at my book review when I was lucky enough to receive my own copy of Leanne’s book. I made her keto Turmeric Milkshake. It is an incredible example of her creativity. 5 copies of the super bundle eBooks – kindly donated by Melissa Sevigny, at I Breathe I’m Hungry. Each bundle contains the following eCookbooks. 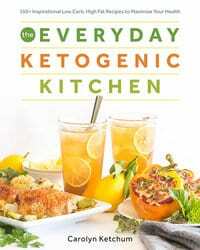 Everyday Ketogenic Kitchen, kindly donated by Carolyn Ketchum, at All Day I Dream About Food. 150 inspirational low carb, high fat recipe to maximise your health. Each recipe comes with full colour photographs. How to stock your low carb pantry. Tips and best practices for cooking and baking. There are recipes that fit every dietary restriction, as well as suggested swaps and substitutions, so whether you are dairy-free or nut-free, you will be sure to find dishes that suit your needs. 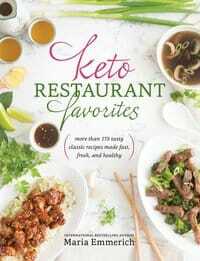 Keto Restaurant Favourites, kindly donated by Maria Emmerich, at Maria, Mind, Body, Health. Maria’s incredible book shows you how to re-make your favourite restaurant meals, the keto way. Bacon cheeseburger, corn dogs, curry, cannoli, gnocchi, copycat frosty , and many more. With nearly 170 (yes, 170) recipes will make even the pickiest eater happy. Say goodbye to deprivation, and say hello to amazing dine-in healthy, keto, nutritious meals. Eating keto doesn’t mean that you have to give up the dishes you love! Instead, Maria shows you how to re-create those recipes, keto-style. 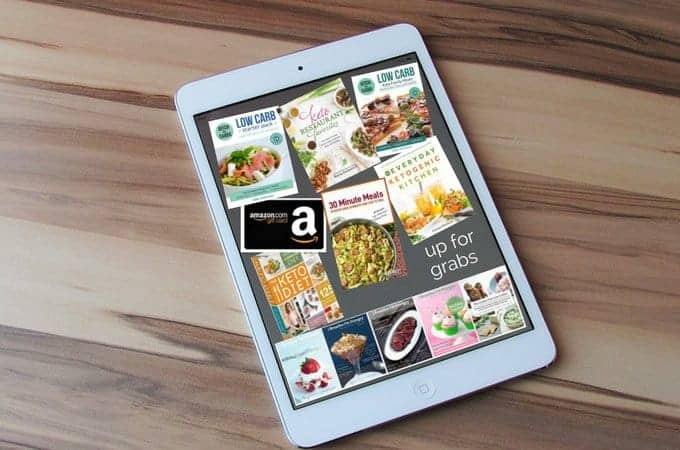 $50 USD Amazon gift card, kindly donated by Kimberly Hardesty, at Low Carb Maven. You will be spoiled for choice for breath taking low-carb recipes over at Low Carb Maven. She has the best recipe for black bottomed pie, the perfect low carb flaky pie crust, sugar free coffee creme brûlée, and the best low carb caramel sauce. So head over and take a look at all her recipes. You won’t be dissapointed. $60 FREE organic groceries – Thrive market is a membership site where you can shop the best organic and non-GMO groceries delivered to your home for FREE on all orders over $49 (available to US residents only). Thrive has more than 4,000 of the highest quality organic, non-toxic foods, vitamins, home cleaning and personal care products at 25–50% off retail prices. Think Whole Foods products at Costco prices, with the convenience of Amazon. They are currently offering my readers $60 free organic groceries. Click here to take them up on their generous offer and to read all the current terms and conditions. iHerb – 5% off for all new AND existing customers (FREE shipping may also apply). Every iHerb order is eligible to receive discounted or free shipping for U.S residents. In general, the more products you add to your cart, the greater the likelihood that you will receive free shipping. In some cases you’ll even find that ordering one product alone may result in free shipping. Each entrant is eligible to win one prize only. The giveaway will run from Monday 11th September 2017 until Saturday 30th September 2017 NZ time. Each winner will be chosen at random and using Rafflecopter and notified by email. Their email will be sent to the publisher to arrange delivery of the prize. This giveaway is in no way associated or endorsed by Facebook. How to enter: the more ways you enter, the more chances you have to win my mega giveaway prizes. Ticket 1 (required) – Leave a comment below with your BEST tip for surviving Sugar Free September 2017. Is it sugar free gum? Drinking plenty of water? Avoiding fast foods joints on your lunch break? Throwing away all your junk food? You can come back and enter each day if you leave another tip in the comments. UPDATE: This giveaway is now CLOSED!!! Please see below if you are one of my 25 lucky winners. I will email each of you directly to arrange delivery of your prize to you. CONGRATULATIONS !!! Stay positive! It is a journey not a race so if you slip up just get right back up and keep going. We got this! The best thing I did for sugar free sept was to give up fruit and chocolate too!! No cravings whatsoever, Whereas in the past I’ve always still wanted to cheat and looked forward to when I could have something again. This time my head has got the hang of it and I know that the cheat meal just isn’t worth it. I was so committed this month and it shows! My head was in the game too. Forever! Plan ahead – write a weekly meal plan and then shop for the week ahead. Prep as much as possible e.g. wash and cut up vegetables and place ready to use in fridge, hard boil half a dozen eggs, dice chicken. I have to get better at this and at logging what I eat. Low carb, healthy fats & flavored water. Once I decided to go sugar-free, I got rid of everything in my pantry that would be a temptation to me. After a couple of weeks, I didn’t even crave sugar anymore. Knowing sugar causes cancer, made it easy for me to give up on sugar for good! Cancer occurs in my family . Sugar should come with a warning on the pack similar to cigarettes. The best way to curb those sugar cravings is have a snack of pork rind scratching or a handful of nuts!!! Failing that I grab a granola bar either with or without chocolate topping which is just enough to curb those sugar tastes!!!!! Excited to enter!! My best way to avoid sugar is to not buy it!! I’ve been tempted a couple times but I reminded myself that it’s poison and does not belong in my body! So far it has worked! What you tell yourself can become your reality. My best tip was to visualise how your body would be rejoicing eating wholefoods that was designed fuel your body to LIVE! Having bulletproof cacao (not a coffee drinker) enabled me to fast up to 72 hours and that it allowed for my insides to have a wee holiday from processing foods. Don’t walk down the bread aisle at the supermarket. You don’t need it!! Artificial sweeteners. Iced tea, iced coffee, hot chocolate, all with artificial sweeteners to tackle the sweet tooth. I know, not the best thing in the world, but better than sugar to start with. I am taking your advice and gradually reducing how much sweetener I use, which has been working well so far. My tip is to plan ahead and always have something ready when you need it. And always have water in hand. My tip is to brush your teeth when you start to get a craving. It’s a mind thing combined with the smell of the toothpaste. Eating plenty of healthy fats so I feel full and satisfied without any need for snacking on sweet treats. Oh and i forgot to add that i also jumped on the mini trampoline for a few minutes each day, only ate when hungry…sometime not even when i was very busy, did some intermittent fasting, ate more veggies and butter than proteinmost days, and i try to get enough sleep. Feeling awesome at day 28! So much energy! Walks daily, lots of water and filling up on good for me fats has helped me overcome a very large sweet tooth! Eating very low carb kills the cravings and planning ahead helps you stay on track when you stumble. Those two are my best tips for living sugar free long term. i keep a few sugar free candies or sugar free gum in my pocket and eat them whenever i need a sweet fix. Increasing my water intake. Slowly introducing LCHF to my family and because it has been gradual they haven’t noticed to much. I also look at the labels so surprising how much sugar is hiding in every day items!! My tip is to replace any snacks with the many low carb fat bomb recipes out there. They are wonderful substitutes and filling too. Drinking lost of H20 and eating a piece of fruit to curb the sugar cravings! Thank you for a chance to win some fantastic prizes that are amazing!!!! Eating sugar free gum and exercising regularly to keep active helped me to stay away from cravings! My tip is like many others- stay busy! I spend every extra minute of my day outside, learning, doing projects, socializing, window shopping, etc. That way you are improving your well- being and not wandering around the house with food staring at you. I have become obsessed with fruit. I have been eating watermelon like its my job. Totally satisfies my cravings! While the weather is still good, stay outside and move as much as you can. Take walks and enjoy the fall colors, do the last of the season gardening. Drink plenty of water and have healthy foods prepped for quick grabbing. That will reduce the temptation to grab something sugar laden. Embraced the fat! 🙂 I couldn’t believe how much better food tasted when you actually include fat. Heavy cream in my morning coffee feels so decadent! Making sure I’m eating enough fat has really helped curb the sweet cravings. Gently introduce LCHF to your family. I have been living this life-style for two years and have lost 50lbs and kept it off for the majority of that time. The challenge is with my family who will not buy into the low carb life-style. It becomes a problem sometimes. I have been doing low carb since March 2017 and feel great. I am not a sweet tooth person but once in a while I crave a sweet. My go to are berries and full fat yoghurt, 1/2 cup does the trick. Sugar free gum helps curb the sweets craving! Thanks for such a wonderful opportunity to win such fantastic prizes!!! Love IT! I think being full helps. If I’ve filled up on healthy foods, I just don’t have room for anything else. Reading the labels! Amazing how much sugar has been added to everything these days, simply being aware of what is really in the food I buy has allowed me to make better choices! Top tips to survive Sugar Free are to drink plenty of water…snack on nuts….kale “crisps” and be prepared to try new ideas and recipes…also get the family involved it is much easier when we both ear the same meals! Don’t think I have any tips😢😢😢 I wasn’t able to stick to it. I Keep trying and failing , I have a REAL addiction to sugar which I really want to get rid of but so far it’s not working. Mine is not just a comment, but a whole paragraph! After discovering “www.diththecarbs.com” website end of January 2017, and going on the LCHF journey has been a blessing in my life. Together with DietDoctor. I promote these two sites to all my friends who have fallen off the “Banting” like we say in South Africa, LCHF lifestyle. Or who are desperately trying to lose weight. I just tell everyone to sign up for the newsletter and get their mind empowered with all the knowledge Libby shares through videos and articles and then start the journey when they are ready.. I was using Xylitol already for the past year, but decided to sign up for Sugar Free September to empower myself with more knowledge and to assist my 11 and 8 year old to go sugar free and LCHF. What made it easy for me to do Sugar Free September was watching “That Sugar Film” with my 11 year old and seeing the total shock and discuss on his little face. After that I stopped taking any sugar/xylitol in my coffee and haven’t touched it since. Even my husband has given us sugar after I showed him the video how sugar ferments in your tummy. The whole family is now on the LCHF diet and doing really well. I love Sugar Free September! I found drinking water, fat bombs, and following a set meal plan is the best for me. I was using beginner keto for the month plan. It takes all the stress out of shopping and planning. Plan your meals… It’s easier to keep to a plan than going with the flow. We get busy, lazy, tired, bored, but if you’ve planned and shopped it’s easier to maintain your momentum. I am using stevia in things I normally use sugar in, and can’t do without. Sugar free gum, ACV with water and having my first meal of the day later each day. Having one or two lo carb snacks on hand for emergency cravings and a few nuts if I genuinely get hungry away from home. We have been cutting back on sugar and carbs for a few months so I was ready for sugar free September, my best tip is to have a low carb high protein shake during the day this really helps with cravings. Herbal teas, some of which are naturally sweet eg liquorice! Drinking lots of water and having some of Libby’s chocolate granola! My tip is to realise that sugar free doesn’t mean taste free by looking for recipes on Pinterest. There are so many yummy keto recipes! Drink lots of water, be a planner, track your macros & calories, and most of all join a support group. There’s so much information, recipes, and tips to share. Keto has changed my life and I’m sticking with it. Love it! Thanks! Keeping hydrated and active have made this month easier. The Daily emails with tips have helped too. drinking ginger tea which is very healthy!!!! Drinking plenty of water (or sparkling mineral water) and herbal tea helped me to stay away from sugar addiction! Two Russell Stover Dark Chocolate Pecan Clusters if the sweet tooth is craving something. Planning ahead and prepping over the weekend will help you avoid eating something you don’t need! Lots of H2O, pork rinds when the cravings get bad! I have been eating a ketogenic diet and staying motivated by being part of support groups like Ditch The Carbs on Facebook. chia seed pudding with coconut milk – comforting and satisfying! I’m so proud of myself to have been sugar free for 25 days! This is a great challenge. I am celebrating myself for reducing my sugar intake so significantly. Letting go of my sugar habit has increased my awareness of how great I feel filling up on vegetables and other good food! I think having low carb foods, cooked and ready has been helpful. I’ve bought almond flour and coconut flour, to make bread, biscuits or desserts to freeze when a craving comes. Although it doesn’t always help. This is my second year doing Sugarfree Sept, what worked for me was having nothing in the house – getting rid of Sugar, cookies, cereals, and replacing them with the suggested foods. At work is easy, but it is when I get home that I find the hardest – so get rid of it all so there is no temptation 🙂 It is too easy just to pass by the cupboard and grab something yummy. Drinking lots of water and getting outside with more yard work . Lots of water and getting rid of the junk food. This has been a great challenge, your emails where helpful and motivating. I am hopeful to continue the low carb lifestyle I started this month. Thank you! What helped me the most was the simplest thing, drink more water!! My tip? It’s one month, people! Just tell yourself….I can eat sugar any time I want. It’s not going to disappear after September… just give it one month! Using low carb tortillas for my LCHF diet plan is the perfect bread substitute. My tip from sugar free September is like you always said, progress not perfection! I may not have done everything perfectly everyday like I hoped I would, but I know I made huge strides in cutting sugar from my life, so thank you so much for the motivation! I allow myself one piece of fruit a day! It tastes so good and fills my sweet tooth! I have been loading up on liquids which is helping to curb my cravings (water, green tea, broth). When I really crave a sweet, I fill my magic bullet with chilled coffee, ice, a bit of cream and a touch of swerve confectioners or vanilla stevia..blend and enjoy. Feeling fantastic on Day 22! I’m amazed at how much sugar is hidden in all the products. I’m looking at everything now to see how much sugar it has in it. I love all the veggies I’m eating! Drinking SOBE water instead of anything with sugar, and allowing myself a Ghiradelli dark chocolate chip or 2 each day (1 carb per 2 chips!). Helps keep my sweet tooth in check! As a reformed soda drinker, I was able to give up the sweet stuff when I discovered unsweetened iced tea with stevia. I’ve managed my habit of eating after supper. I stop eating after 7:00 p.m. Eating this way, curbs my sugar cravings. Feeling awesome! Celebrating day 20 of being sugar free! I can’t even start to tell you how good I feel! This is a life changer! I find my sweet tooth has pretty much evaporated and I am enjoying all the veggies I’ve incorporated into my plan! Fat bombs are my go to for a treat that’s doesn’t blow up my diet. My best tip for sugar-free September is giving up fake sweeteners for a couple of wks., then you stop craving sweets. It’s a mind over matter thing for me, giving up sugar. I found zesty pickled canned asparagus at the store and it fills the gap nicely! Best way to survive Sugar Free September is to remove the temptation! Nothing in the house to grab late at night, no “let’s just look at the dessert menu,” no temptation. Sugar free gum is the best for me and plenty of water. Love your website and so happy to be participating in Sugar Free September 2017. I make a coconut milk hot drink with 1 tps. of cocoa powder (mixed with cream). I drink this at night. I’m surprised how good it tastes without sugar and satisfies my chocolate craving. Today I found the recipe for Keto tumeric drink and will try that! Thanks for everything! Drink a lot of water and allow myself a fatbomb (or 2) after dinner for being good during the day! Is it open to Canadians? My biggest tip for surviving is to drink black coffee. It really helps me with any sugary cravings in the morning. Yes the giveaway is open worldwide!!! Water or hot herbal tea! Eat a lot of fresh vegetables, get physical exercise and drink lots of water! fruit flavored water and go for a run! For me, the biggest way to cut the sugar was to figure out what liquid stevia worked best for me. Sweet Leaf English Toffee has been my life saver in my morning coffee. Easiest way i found to stay on the sugar free wagon is to plan your meals ahead. Knowing what you will be eating helps cut out the fancying of foods. When those sugar cravings hit, drinking water, going on walks, and meditation all truly help! Sugar free gum is a life saver for me. So is Starbucks Zao passion fruit teabags I can make at home. Also, drink plenty of water/seltzer/mineral water. Stay hydrated-it helps cut the cravings! I committed myself to a Sugar Free September and I started eating LCHF. I ate LCHF for a few months and felt so good but fell off. I’m back on. I had inflammation in my Achilles Heel and it’s pretty much gone. I think it’s because I am eating so well and I cut way back on my alcohol consumption! I love the support in this group and this WOE. I’m really staying away from all sweet things right as I want to loose weight. Thank you! Be prepared. Plan out your meals and have some sugarfree sweet treats available in case you want one. If the good stuff is readily available then the bad stuff won’t be as tempting. My biggest weakness was sweets so I was always failing when I avoided them totally now I give in with a lowest carb alternative I find on pinterest and it helps my sweets cravings. My best tip for sugar-free September is to focus on what sugar and carb-filled foods do to your body instead of what they taste like. Then eating LCHF becomes empowering rather than restrictive. I recently read an article with a statement that sums it up perfectly for me: I CAN eat all of those things, I just don’t WANT to. Lots of water. Following my personnal rules, and some sugar free treats along the way. Plenty of sugar free bak9ng recipes to try whenever I get cravings!! My best sugar-free tip is to make some special sugar-free goodies from your site, or to buy a chocolate bar of 70 percent or more cacao, and have a couple of squares per day. Thanks for your wonderful recipes! Such an amazing giveaway! Sharing! My best tip to surviving sugar free September is cheese! I love cheese more than sugar, so in those first few rocky days I don’t limit it. When it comes to food, I find strict rules easier to follow than flexible ones. Telling myself “I don’t eat that” works much better than “should I just have one cookie? Maybe just two…”. If I’m just not allowed to eat it at all, I can easily put it out of my mind. Remember that you are doing this for you and your health. I have doubled my intake of green tea, any time I feel tempted to go off track I put th kettle on instead! Cheese is life! Who needs sugar when you have cheese?? My top tip is to be prepared, always! Make sure you take time to plan not only meals but snacks also, and always have something ready to eat for both sweet and savoury cravings. I find that when I don’t have anything in the house, that’s when I start craving crisps, chocolate, biscuits etc.